Lobster! So delicious and good for you but it also can be a little confusing. We will tackle some popular lobster questions below. If you have any questions about lobster, please contact us and we will get back to you shortly and maybe even add your question to our site. Maine lobsters are usually steamed or boiled in sea water but heavily salted tap water will do. Boiling lobster will take a little less time and the meat is easier to get out of the shell. Steaming is more flavorful and produces more tender meat. You can eat lobster in a variety of ways, feel free to check out our recipe section for some easy and hassle-free ways to prepare Maine lobster. Live lobsters are actually dark bluish green to greenish brown until they are cooked. That is when they get their bright red coloring. Have you ever seen any other colored lobsters? Approximately one in every two million lobsters are blue. 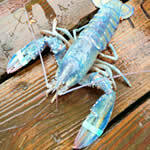 There have also been live bright red lobsters, yellow lobsters and calico colored lobsters. All are VERY rare. Did lobster really used to be served to prisoners? Lobsters didn’t start out with their reputation for elegance. During the colonial era, lobsters were so plentiful that they were served to prisoners, apprentices, the poor and the indigent. It was rumored that that the phrase “doing hard time” actually referred to the shells of the lobsters served at prison dinner. 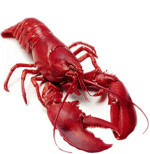 Lobster didn’t shed its negative reputation until the late 1800s. Is lobster good for you? Known as a ‘treat’ food, lobster is actually one of the healthiest proteins you can eat. Lobster meat actually has less calories, less total fat and less cholesterol than a skinless chicken breast. Lobsters are a wild caught, naturally fed and free range food. Free range, sustainably harvested and completely delicious.